Sounds like a sophisticated process about which I know nothing (! ), but the result is certainly spectacular. I wonder about including the station- is it a commentary on the juxtaposition of nature and man-made power? The very dark portion puzzles me too- is it a tree? Not a criticism, mind you- just curious. Love seeing all the stars! Thanks. Yes, it's a tree but probably better cropped out. The station is included just as an item of interest. I'm not sure the tree is a problem-perhaps it looks overly large compared to the other trees though. What if you just cropped the whole picture a bit from the top where the tree tends to look more like part of the sky? The hydroelectric station does add an interesting structure to the dark base of the scene, Mike, and I like the large tree as presented - especially when you click on the image for the uncompressed view. 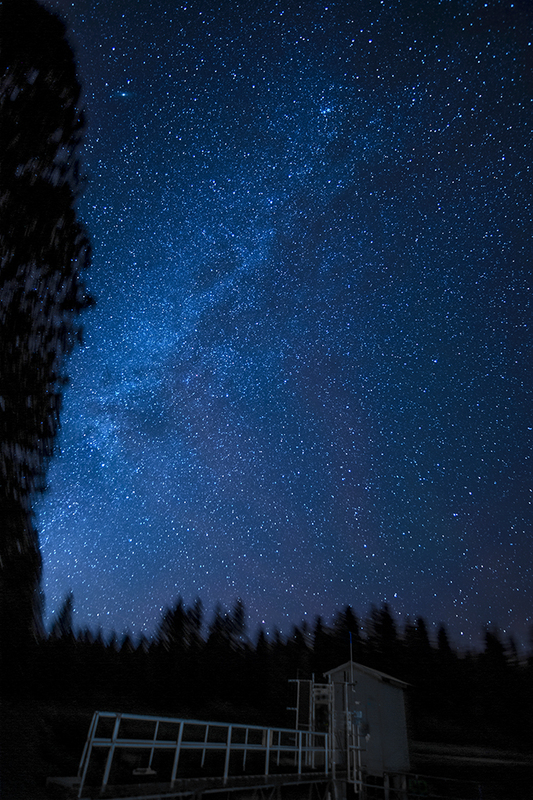 The night sky with its myriad of stars is beautifully captured, and the scene as a whole is quite stunning! Did you build your own barn door tracker...or buy one? I bought a nyx tracker kit for $79.00 and put it together in an hour. It seems to work pretty well but I was out this evening and shooting very high up in the sky was difficult depending on the direction I wanted the camera to point. I've had success with the 12mm Rokinon but tried a couple of times to use a 90mm lens and it's not tracking very well. I think I'm having trouble with the alignment of the tracker to Polaris. All in all it works but I'd rather have a regular star tracker starting at about $300.00. Make sure that you are not aligning to Polaris! You need to align to the NCP for utmost accuracy....see here. This is a interesting site with a lot of good info. It really is enjoyable although I'm new at astrophotography. I can see that using a wide lens is a lot more forgiving in the results than a long lens. thanks!